A well-maintained property increases the value of your rental unit. Putting time and money into simple home upgrades brings a big return in the end. With more than 30 years of experience in property management, Elk Grove, CA homeowners can trust the experts at Real Property Management SAC-METRO. We provide quality, cost-effective maintenance solutions that will have your investment property up-to-date in no time. A long list of home upgrades is daunting and unreasonable. So begin with the basics – walls and floors. A fresh coat of paint and new flooring make the largest impact on the appearance and feel of a home. New paint makes for a clean and inviting look to your rental. Neutral tones are best. Applying new paint is a classic home upgrade for a reason. It always improves and makes a big difference in the look of a home. Now when it comes to flooring, dingy carpet is an immediate turn-off. Installing hardwood or tile transforms a room. If you cannot restore the floors throughout the entire rental, that’s all right. Just selecting to refinish the kitchen or bathroom is a great start. Additional home improvements include replacing window coverings and even the front door. Broken, old, or discolored blinds really date a property. Brightening up a room with new blinds or curtains is an eye-pleaser and worth the investment. As for the front door, it is the first place tenants receive a first impression. A scratched, worn door covered in grime and dirt gives the impression the property is not well maintained. If replacing the door is not an option, then repaint the old one or add a new handle. 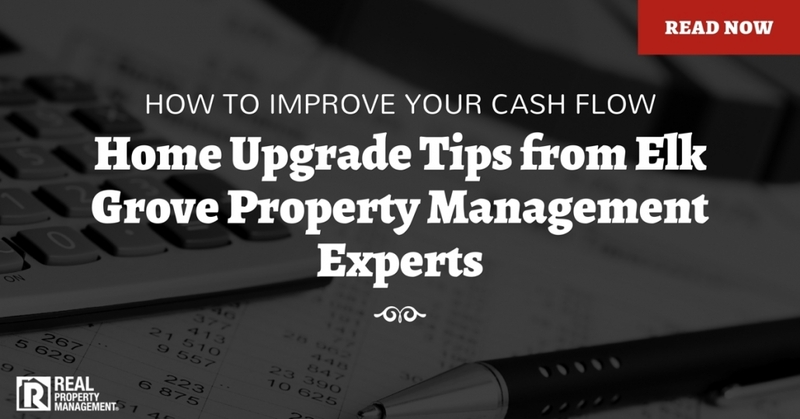 Elk Grove, CA homeowners can successfully improve their cash flow when utilizing the services of our Elk Grove property management team. Working with Real Property Management SAC-METRO is an easy solution to the many hassles of being a landlord. Our professionals understand the industry and know how to safeguard your rental. See what we can do for you!